"Cyber" Tours - Your Neighbors Visit Maine. 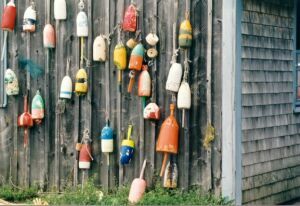 More photos and stories about vacations in Maine. Maine as your neighbor experienced it. What a great way to get acquainted! Call us to discuss your property search. "One night I woke up at 2 AM in York and wandered out on our dockside porch. The moon had just risen, the stars were bright, and in the distance were flashing glows of lighthouses. 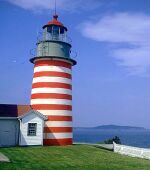 One morning in Boothbay Harbor, I awoke to a view of stormy skies, crashing waves, gusty winds, and hundreds of lobster trap buoys struggling to stay afloat in the heavy seas ... and yes, there in the mists was two lighthouses flashing their signals and warnings to those afloat. 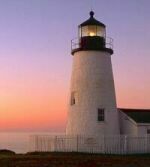 Don't miss seeing and experiencing Maine - it's like a whole 'nother world..."
"A fellow teacher at Audra's school has a family vacation home in Edgecomb, not far from Boothbay Harbor, and we were invited to use it for a week this summer. Between the price break of not having to pay for a room, and the background on the region that we already had from Mike, we couldn't pass this up. What follows is a look at some of the highlights of our journey, and some wisdom from the road."